Wychnor Lock No 11 is a minor waterways place minor waterways place place on the waterways major waterways place village town city on the Trent and Mersey Canal (Main Line - Burton to Fradley) between Branston Bridge No 34 (Branston) (4 miles and 4 furlongs and 2 locks to the northeast) and Gaskells Bridge No 46 (Alrewas) (1 mile and 3¼ furlongs and 1 lock to the west). 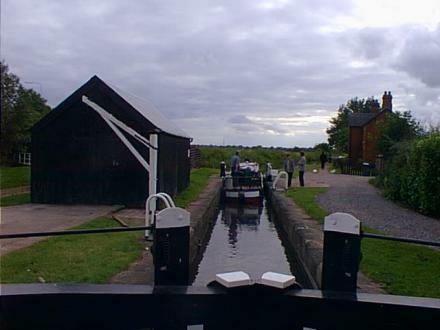 The nearest place in the direction of Branston Bridge No 34 is Wychnor Bridge No 43; a few yards away. The nearest place in the direction of Gaskells Bridge No 46 is Mill House Bridge No 44; 2¼ furlongs away. Wychnor, Yoxall, DE13 8 — 1075 yards to the west. Barton under Needwood — 941 yards to the northeast. Burton upon Trent, DE13 8 — 885 yards to the west. 911 yards to the north. 6 Station Yard, Croxall Road, Alrewas — 1613 yards to the southwest. Northgate Lodge, Wychnor Park, Burton-upon-Trent, DE13 8BU — 1075 yards to the west. Alrewas, DE13 7AT — 1514 yards to the southwest. Barton under Needwood — 1165 yards to the northeast. Barton — 1165 yards to the northeast. Wichnor — 1237 yards to the south. Burton-upon-Trent — 108 yards to the northeast. Burton College, Burton upon Trent, DE13 0PD — 1453 yards to the southwest. 49 Micklehome Drive, Burton upon Trent, WS13 7AU — 1473 yards to the southwest. A38, Barton under Needwood, Staffordshire, DE13 8 — 156 yards to the northeast. Burton-upon-Trent — 1453 yards to the southwest. Barton Business Park, Barton under Needwood, DE13 8BX — 1634 yards to the northeast. 1572 yards to the southeast. 1559 yards to the south.